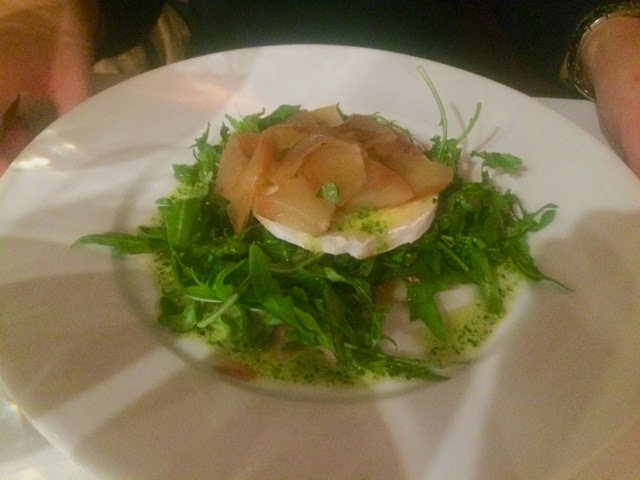 I first visited Café Des Amis about two and a half years ago with a friend, I had a lovely meal, a lovely evening and said I’d definitely come back again. The restaurant is always popping up on Open Table deals and similar and there’s even a couple of offers available on their own website so I don’t know why it’s taken me so long to go back (so many restaurants, so little time!) but go back I did with my sister last week to catch up after my return from California. We booked with a voucher available on the Café Des Amis website, a really good deal for two courses from the Brasserie menu with a bottle of house wine for £30. Bargain! The restaurant was absolutely heaving when we turned up, very noisy (almost a tad chaotic) but I took this as a sign of popularity and it was clearly leaving time for the pre-theatre crowd so they were probably hurrying to get everyone paid up on time. I anticipated a small wait, we had a reservation but there were a couple of others waiting to be seated too. I was perfectly happy to take a seat in the waiting area, but began to feel a little put out when two other parties of two walked in, also with reservations and also with the same voucher as us, and were seated straight away. We were eventually seated in the upstairs dining room (where there were actually quite a few free tables) and decided to overlook this initial disappointment and get on with enjoying our meal. Service was friendly however the waiter failed to offer us any drinks and I had to ask for our bottle of wine after our food order had been taken. The wine arrived without a ice bucket and began getting a little warm before I managed to get the attention of another waiter who seemed quite surprised that we didn’t have one. So I settled in with a glass of wine and my starter of cream of mushroom soup (for which I was given a dessert spoon, which I actually heard one of the waiters comment on but he didn’t correct it). 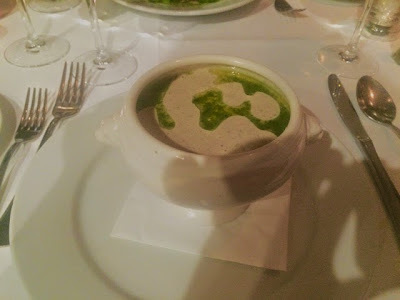 The soup was really quite enjoyable, the herb infused oil drizzled on top didn’t look all that great but tasted nice and was a good contrast to the creamy soup. Not too heavy and with a good silky texture this was a pretty decent mushroom soup. Whilst I was enjoying my starter I noticed that the table next to us, being served by the same waiter and who also had a voucher, seemed to have no problem getting their drinks, ice bucket etc and also alerted us to the fact we didn’t have any napkins either. A little observation lead me to realise that almost every table in the place had a voucher so I can’t put it down to this that we weren’t being bothered with. There just seemed to be an enormous amount of inconsistencies. In our section the couple next to us seemed to be receiving excellent service, whilst two tables down actually got up and left before ordering, leaving half their drinks. It was a Wednesday night so I’d hate to see what happens on a Friday/Saturday night rush. 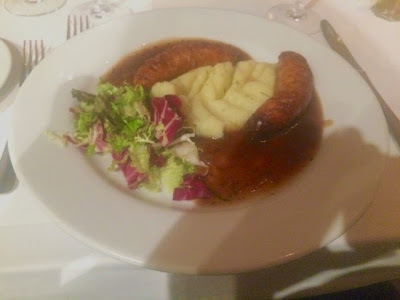 Our mains arrived very shortly after our starters and I went for what was essentially posh sausage and mash. Aside from the garnish of salad on a warm plate with gravy (why?) this was a very enjoyable dish. Two nice big meaty toulouse sausages, creamy buttery mash and a really tasty sauce.. what’s not to love? 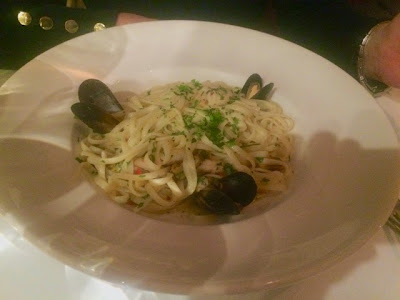 My sister had the linguine which was generous on the seafood, not too oily and well seasoned. It took quite a while for anyone to come and clear our plates when we were finished and by this time we were a bit fed up of the whole experience and didn’t wish to prolong it any further by ordering a dessert. We ordered our bill and needless to say we didn’t pay the service charge. I am well aware that we had a right bargain and therefore it’s a bit rich to moan about anything at Café Des Amis however good service really doesn’t cost anything and if a restaurant takes pride in its service it really should treat all customers equally. Café Des Amis has really jumped on board the discount deals band wagon as vouchers and deals are always popping up on Groupon, Open Table etc. I did wonder if that would have impacted upon the food, perhaps meaning that I wouldn’t get quite as good quality grub as I did a couple of years ago, however there was absolutely nothing wrong with any of the food. The food was good. It was purely oddly inconsistent service that let the whole thing down. Remembering to put napkins on a table, take a drinks order, put the white wine in an ice bucket and give you the right cutlery doesn’t (and shouldn’t) cost any extra. I was looking forward to visiting this restaurant again however, regrettably, I don’t think I’ll be back.